If you were unable to attend the event, or missed the panel, please find a recap below. Jack Neill, VP of Client Services at HelioCampus, moderated a session that included leaders from Ithaca College, Clark University and UMass Lowell. They discussed the top 2018 EDUCAUSE IT Issues, with a focus on analytics. Given the increased awareness and the importance in leveraging data and analytics in higher education, it is not surprising to see four analytics focused issues in this year’s top 10 list from EDUCAUSE. According to a recent collaborative study by the National Association of Student Personnel Administrators (NASPA), the Association for Institutional Research (AIR), and EDUCAUSE, while a majority of institutions (73 percent) systematically collect and integrate data from student information systems, less than a third of them actually used the data to effect change. While this demonstrates great progress in collecting data, if it is not being used to improve outcomes, we still have a long way to go in using data effectively. With this in mind, the panel members shared how they are tackling the following four 2018 EDUCAUSE top IT issues: data management and governance, data-enabled institutional culture, digital integrations, and becoming a more student-centered institution. Each panelist opened up with an explanation of the catalyst for their analytics initiatives on campus. Yuko Mulugetta, Chief Analytics Officer at Ithaca College, shared that with their high tuition rate, they really need to articulate the value they are providing to students and families, and they need data in order to do so. Also, after taking the EDUCAUSE CDS BI Maturity Survey in 2016, they realized they were behind their peers and needed to catch up in this area. Pennie Turgeon, Vice President for Information Technology and CIO at Clark University, shared that for years they had been talking about creating a centralized analytics platform but without action. Why not? Stakeholders did not feel like the right questions were being asked yet. However, in 2016 they were ready and started putting together an enterprise data strategy. They also tried a data governance initiative but without some other outcome, it was hard to do. Pennie used a great analogy with regard to data governance – people do not want to talk about the plumbing (ie- data governance), they want to build the house, paint the walls, put up curtains etc. It was hard to get off the ground. They found more success with a just-in-time governance model. They also needed a single version of the truth at Clark because everyone was grabbing data from whatever source they could get their hands on and the numbers were all different; no one had confidence in the data because everyone was looking at it from their own departmental lens. At UMass Lowell, Michael Cipriano, Associate Vice Chancellor and CIO, shared that when he attended biweekly meetings with stakeholders, they reviewed a paper admissions report without any way to interrogate the data or answer questions on the fly. He envisioned a better way and really wanted to provide self-service analytics to those who are running the university. After learning more about the background of each panelist, and the impetus for their initiatives, we dove into the issues. Pennie shared that at Clark, they are trying to paint a fuller picture of the student experience by looking at all the major touch points with students to support holistic advising. Even with their very high retention rate (hovering at 86%), they wanted to do more. Instead of focusing on the students who are leaving, which is such a small number it’s really hard to determine why, they flipped the script and decided to focus on why they are retaining their students. By looking at questions like, did we admit the right students in the first place and did we use our financial aid wisely, they are now trying to strategically find and fund the right students so they retain and persist. Michael agreed with Pennie in that there were moments at UML when they were also asking themselves if they were admitting the right students. Now they are making strategic moves to change this. His goal is really to establish an environment where no matter where the data lives, they are able to get to it, and include information that has previously never been coupled with academic performance. 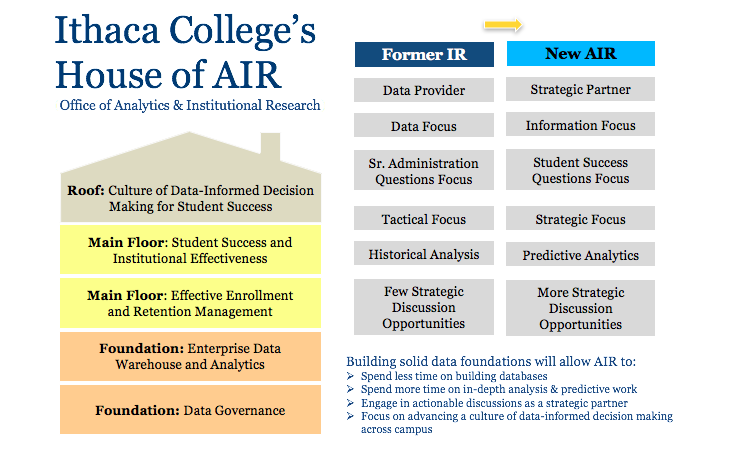 When the President at Ithaca College decided it was time to really tackle data governance and analytics, it started with the creation of a new position: Chief Analytics Officer. Yuko eventually took on this role and began to build the House of AIR (see visual below.) Ultimately, she and her team embarked on building the foundation of house in order to create a culture of data-informed decision making for student success. Her office also morphed from a more traditional IR office with a tactical focus to really becoming a strategic data partner for the college. In terms of data governance, Ithaca attempted this previously with a top down approach and it was unsuccessful. For round two, her team set up a two-tiered data governance structure which was much more of a bottoms up approach, starting with the people who were really involved with the data and reporting. This has been much more successful for Ithaca. At UMass Lowell, the Provost wanted the university to be more data informed and data driven, and he really set the tone for creating a data-enabled institutional culture. Also, operationally they took steps to make each college responsible for their own P&L, which has helped since they really need data to be able to do this effectively. At Clark, they are using the desire to create a data-enabled institutional culture as a catalyst to address various ways in which their current practices are not reflected in their data. Pennie shared that when you have disparate systems, it effects the way the people who are owners of the data really views them (in a silo), so if you have a catalyst, like a system implementation and governance initiative, it brings people together so they can start to see the downstream impact. Their analytics initiative was really a catalyst to get people to understand how their data might be useful to other departments and to get them into the institutional mindset. All the data is institutional data, not departmental data, which was a shift. At Ithaca, data integration has been hugely important. If everyone grabs information in a siloed fashion, how are they going to integrate the data together? They needed to convert it into actionable information in order to move the institution forward. Critical at Ithaca was the strong collaboration between their IT and IR offices; they are not simply the technology provider and the data provider, they are strategy partners. Finally, Michael shared their best example of data integration was when they brought in National Student Clearinghouse data into their data platform. As a result, if a student chose not to come to Lowell, they were able to see where they went. They have able to use this to make decisions and augment their processes. They also have plans to bring in all sorts of student engagement data on campus next. The room of about 100 attendees seemed to take a lot away from the experiences of these three leaders and their analytics initiatives. We are grateful to our panelists for sharing their wisdom with the group and to the audience for taking time to listen, ask questions and engage with them. We can’t wait to see everyone back at EDUCAUSE next year.